Infographics are now a popular and common way of getting across a lot of information in a short amount of time. The combination of images and text, when used correctly, can educate the reader in all kinds of topics and issues. As infographics are so effective, they're something that you may want to try in your own work. 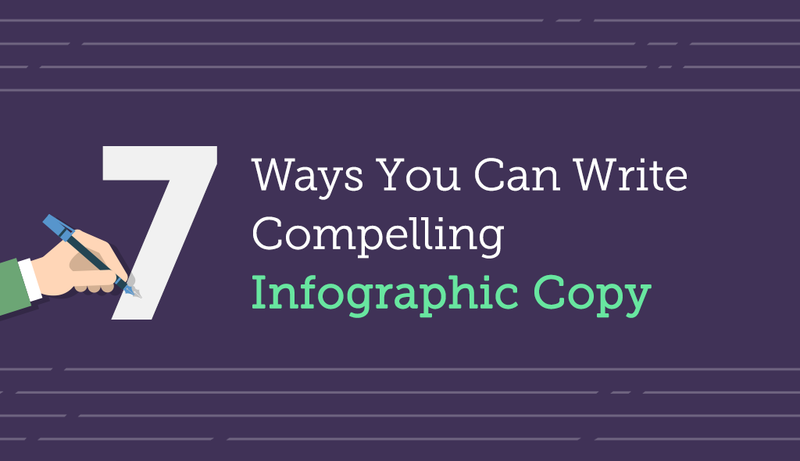 If this is the case, check out these seven ways you can create compelling and exciting infographic copy. Why do infographics need copy? A good infographic leans mostly on the images contained within to get its point across. As this is the case, why is the copy still considered so important? It all has to do with how the information is presented. Images on their own only tell part of the story. That's why copy needs to be included in the right proportions, in order to add value or more detail to the images being used. It's all about the quality of the text. To get started, take a look at this infographic created with Visme or continue below to get more in-depth information on how to apply each tip. 1 Write a short and snappy headline. As with most blogs and articles, your headline needs to be short, snappy, and relevant to your infographic. You probably have seen many infographics that work as listicles, and so have titles such as "6 Items You Should Be Buying At The Supermarket" or "10 Ways You Can Save Money On Your Bills." Numbers are often used to draw interest, as the reader can see exactly how much content you're offering them. Use catchy adjectives too to get the reader's attention. "8 Simple Ways To Improve Your Engine" is a more compelling headline than "8 Ways To Improve Your Engine," for example. It's also a good idea to add call-to-action words. The headline could then read as "Try These 8 Simple Ways To Improve Your Engine." Whatever your infographic looks like, it's a good idea to use your keywords in the headline. This means it's easier to find in online searches and ensures that your headline is relevant. Remember, if your headline isn't related to the content of the article, then readers are just going to click away. Finally, headlines should be kept short because the shorter it is, the simpler it is. The simpler your headline is, the easier it should be to understand. A complicated headline can put readers off as they can't understand the point of your infographic. 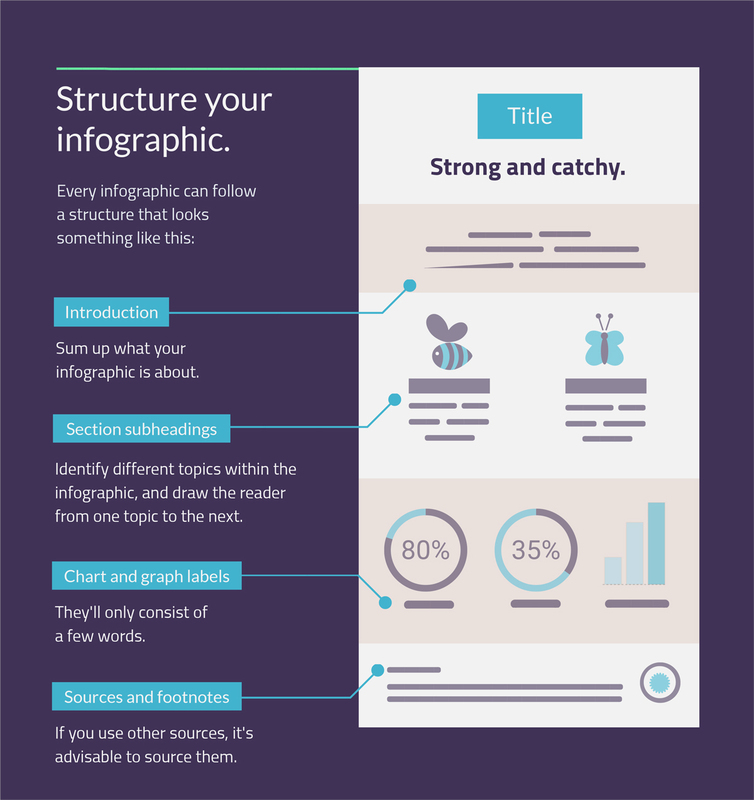 Every infographic you create will need a strong, well-thought-out structure. This will help the reader follow the flow of your thoughts, and create a beginning, middle, and end to your piece. Title: Strong and catchy, as explained above. Introduction: Sum up what your infographic is about. Section subheadings: Identify different topics within the infographic, and draw the reader from one topic to the next. Chart and graph labels: These accompany charts to explain what's being shown. They'll only consist of a few words. Sources and footnotes: If you use other sources, it's advisable to source them. The style you choose will be up to you, so it's usually best to follow the normal in-house citation style. 3 Don't forget to include branding. When writing copy for your infographic, don't forget all the technical details. All diagrams will need to be labelled, links must be included when needed, and your branding must be included. Why is this? It's because, as an image, your infographic has the potential of going viral. When this happens, the image can be shared around with no context of where it's come from. If that happens, you'll reach your audience but they won't know where to go to learn more, losing you potential conversions. To avoid this, ensure your branding is included in the image itself. That can be a link back to your website, or more visual branding in your chosen colors or design schemes. Doing this means that no matter where your infographic goes, people will know where it came from. 4 Don't overload the graphics with text. An infographic is a visual aid. That means that as a rule, there can't be more text than images. 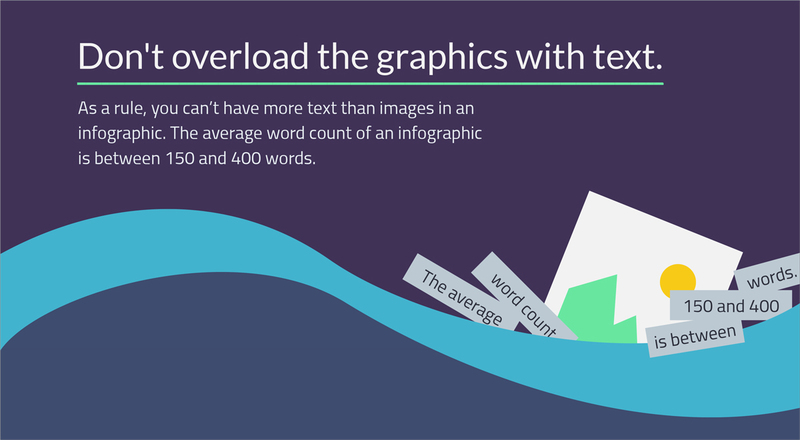 If there's too much text in your infographic, it can put readers off as it can seem too boring to read. This doesn't mean that your copy should be minimal, though. You should strike the right balance between providing enough information and being too verbose. For example, make sure you label all images that need labelling. The key to doing this is just to use a few words to explain what's happening in the image. Make it clear what you're describing, and it'll be much easier for readers to understand what they're looking at in the infographic. 5 Write a good introduction. Before the reader gets to your infographic, they should have a good introduction. This is a couple of hundred words, at most, that explains to the reader what the infographic is about and what kind of information it contains. This gives them context for what they're going to read, and informs them of what's coming up. When you write your introduction, make sure that you keep it short. The reader is there for the infographic, after all. If it goes over too many words, then you run the risk of them clicking away and finding something else to read. When it comes to the infographic, you're essentially supporting the images with your text. Business presentation creator Fiona Davies says, "Your text isn't there to introduce anything new to the image, or bring in new ideas. It should simply explain the image that the reader is seeing." This means that when you're writing your copy, you're taking your cue from the images that are already there. Look at what's been provided, and explain and expand on it so the reader has a full understanding of what's being shown to them. This is the meat of what you're providing to the infographic. Remember, though, don't go overboard. If there's too much text, it'll put the reader off, and they'll go elsewhere. That means that you need to keep this text short and snappy, too. If needed, write a few passes and cut down what you're saying until it's as short as it can be. 7 Proofread everything you write. You're only writing minimal text when creating your infographic, but everything you do write must be proofread carefully. This is because it could potentially be seen by thousands of people. If even one error slips by and ends up in the image, it can be embarrassing at best. At worst, it can actually change the meaning of your text altogether. Before you finalize the text, take the time to sit and proofread what you've written. Go through the copy several times, checking for a different type of error every time. For example, on one pass, look for spelling errors; on another, look for factual errors, and so on. If you're finding it hard to proofread the whole text, try breaking it up into blocks, and proof it that way. You have a smaller section to work on, and so it'll be easier to edit. Since infographics are only becoming more popular, it makes sense that you'll have to learn how to write copy for them. With the right skills and know-how, you can create copy that will get everyone talking. Start creating your own for free with DIY, drag-and-drop tools like Visme. Mary Walton is a professional editor and online tutor, currently living in Santa Monica. She shares her thoughts on education and writing on her blog, Simple Grad. A good infographic is where words, colours and shapes meet to create something outstanding – personally speaking, I think it’s one of the best ways to repurpose your content. I agree, Andrea. For me, infographics are actually a form of “multi media”: a harmonious combination of a variety of formats — text, images and sometimes even video and audio — to communicate a message. Thanks a lot “mary walton”.I will try visme very soon for my next project. Thanks! Let us know what you think of our new Content Blocks feature.